Timeless style, built to last forever…..
We love to collaberate with our clients to create their perfect dining table that will forever have a place in their home. A piece that it exactly the right size for their space and gives them that untangable spark of joy. As well as our portfolio range, we can work together with you to create your ideal table design. We want our dining tables to last for decades, to be used and loved by the next generation rather than ending up in landfill. The natural oil and wax finish applied to the timber is hardwearing but also fixable. This means that the table can be used fearlessly not just looked at. In the unfortunate case of damage, the surface can be spot fixed or resurfaced, the untimate sustainablity. More information on our finish can be found here. To ensure a piece lasts for decades, it needs a sturdy construction that allows for the natural movement of the timber in the environment of your home. We use only the best furniture grade timber as well as top quality glue and hardware. 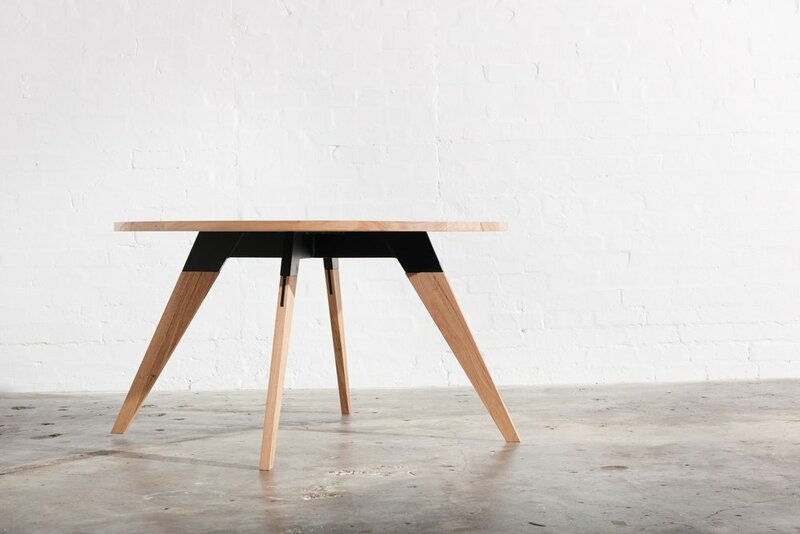 All of the metal elements of our dining tables are handcrafted to order in Melbourne by a small family run business who share our passion for design and quality. We would love to chat to you about your project! Use the link below to send us through the information, book a phone appointment or a time to visit our Torquay workshop and showroom!